Fairfield Prep gathers around their goalie for a pre-game speech by the captains before Wednesday night’s state playoff game against Xavier in New Haven. NEW HAVEN — Their game was Xavier’s season in small form, Fairfield Prep coach Matt Sather said Wednesday night after his Jesuits reached yet another Division I boys hockey final. In a way, though, this season has been classic Fairfield Prep, a season like a few over the past 20 years that came together after the schedule toughened them up and ends with another shot at a championship. “It’s the best feeling in the world, honestly,” Fairfield Prep co-captain Colin Bella said after a 5-2 win over Xavier at Ingalls Rink. The fifth-seeded Jesuits, ranked third in the GameTimeCT poll, built a 4-0 lead after one period and held on behind Jake Walker’s 31 saves. Jack Esse nets the empty netter and Fairfield Prep is going back to the D1 finals. 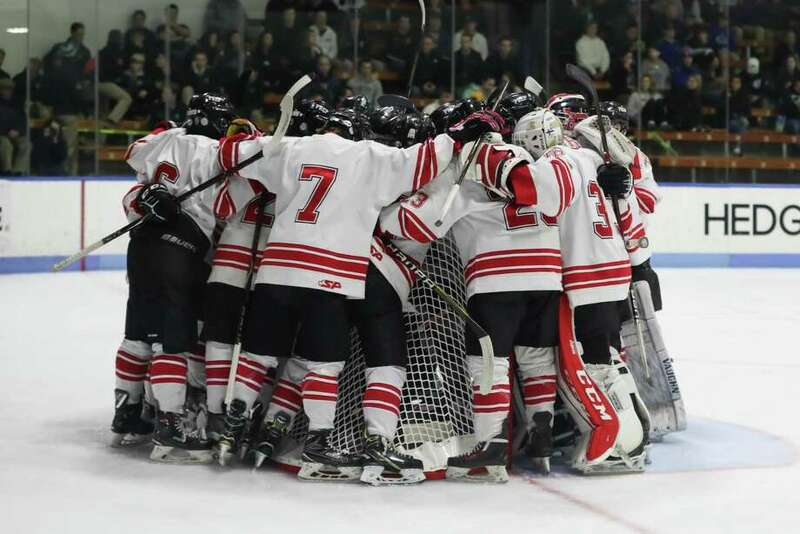 Defending champion Fairfield Prep (14-9-1) advances to its 22nd state final, Tuesday night at 7, also at Ingalls Rink. The Jesuits will meet sixth-seeded, seventh-ranked Notre Dame-West Haven (13-9-1), another team that grew up over the season. This will be the fifth time the rival schools meet in a final since 2001; the Jesuits are 4-0. Eighth-seeded, eighth-ranked Xavier finishes 10-11-2, though it went 9-4-2 in the last 15 games after a 1-7 start against a tough schedule. It remains the only program in Division I or Division II yet to reach a final in any division. “We came out kind of flat, and it could’ve been some nerves. It was a great atmosphere, something these kids may never experience again, even if we won,” Xavier co-coach Kyle Heins said. The Jesuits got off to an early lead on Calyb Reeves’ goal, 2:08 in, a play that started in the defensive zone with a talk between Bella and defenseman Cooper Eckert. Bella said he saw the Xavier defenseman cheat toward him, so he sent a cross-ice pass to Reeves on the left. Freshman Aksel Sather, the coach’s nephew, scored goals 2:13 apart to make it 3-0 by the 10:42 mark, both of them going to the net; one caromed in off his skate, and the other came off a Bella feed to the left post. The Falcons pulled starting goalie Jake Woznyk then, nothing against the senior’s play, Heins said, just looking to change the momentum. But Anthony Clericuzio made it 4-0 a couple of minutes later on a rebound, and the Jesuits were on their way, though Xavier’s sophomore goalie Kellen Beauton held the fort from there. “I thought the first 10 minutes, that was as crisp as we can play, both ends of the ice. You get up that score in a game like this, and it’s hard to keep your edge,” Matt Sather said. The Falcons got goals from Nick LeClaire, the overtime hero of their quarterfinal win over unbeaten Ridgefield, and Trevor Earley, but Jack Esse’s empty-netter finished it for the Jesuits. All but the first of the Jesuits’ appearances in a final, 1977, have been in Division I. They are 17-time champions, again, all but 1977’s in the top division. They’ve won the last 10 titles since Matt Sather’s first full season as coach, 1999-2000, and they topped Greenwich last year. Records: Xavier 10-11-2; Fairfield Prep 14-9-1. Goals: X—Nick LeClaire, Trevor Earley; FP—Aksel Sather 2, Calyb Reeves, Anthony Clericuzio, Jack Esse. Assists: X—Chase Maxwell, Ryan Drust; FP—Colin Bella 2, Cooper Eckert, Mason Whitney, Lucas Baksay. Goalies: X—Jake Woznyk (4 saves), Kellen Beauton (21); FP—Jake Walker (31). Shots: X—33; FP—30.